Nathan Lee secured a job in television and made his first live appearance as a news presenter before even completing his journalism degree at Teesside University. He is now about to embark on a new role as an assistant news editor with ITN News in London on the national ITV evening news. Nathan, 25, of Peterlee, was already working as a video journalist with regional television station Made in Tyne & Wear before graduating from the BA (Hons) Multimedia Journalism. Three years on, his role with the regional television channel has involved presenting live updates and news packages which Nathan films, edits and prepares for broadcast to viewers watching the channel on Sky, Virgin and Freeview. Nathan also presents a live daily news update on the station, which broadcasts 24-hours a day. 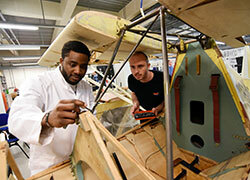 He said: 'Working at Made in Tyne & Wear has really taught me the skills which bigger employers are looking for. 'Employers in television news expect their reporters to be able to do everything, from news gathering and production, to conducting interviews, filming, editing and everything else which goes into a news package. One of his first jobs with Made in Tyne & Wear involved joining a North-East fundraiser on a mercy trip to Greece to distribute aid to stricken refugees, with an exclusive broadcast he made from Greece nominated for a Royal Television Society award. Since then he's reported on some of the biggest court cases in the country, conducted exclusive interviews ahead of the major news channels and hosted live general election debates with candidates in constituencies across the North East. 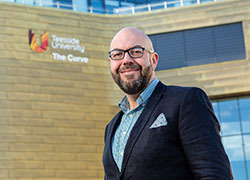 Nathan says it was a combination of the teaching, course content and locality which brought him to Teesside University to study multimedia journalism. 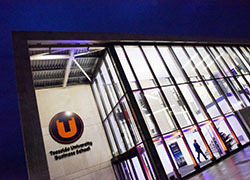 He said: 'The media facilities at Teesside University are really good, with teaching by media professionals who have worked in the industry. It was also important too that the course involved the NCTJ professional journalism qualification. Nathan had initially considered print journalism while completing his degree and completed work experience at regional newspapers which broadened his media experience and helped him to decide that broadcast journalism was for him. As a result of those shifts, Nathan was offered a permanent full-time role while still completing his degree. He is now looking forward to his role as an assistant news editor on ITV national news.